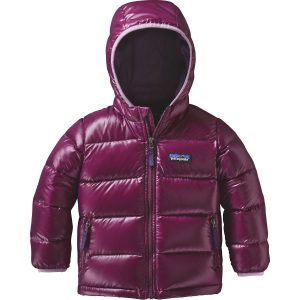 The Patagonia Infant Girls’ Hi-Loft Down Sweater Hooded Jacket is the warmest, coziest they make for babies, and that means it’s up to the task of fighting off frigid winter weather for your precious little lady. Arm your tiny one with its durable, wind-resistant polyester shell with Deluge DWR finish, which lasts and lasts to keep her dry, protected, and comfy. Stuffed with plentiful 600-fill power goose down, this hoodie keeps the warmth lofty and secure for efficient insulation without the weight or bulk. When the cold feels relentless, pull on the insulated hood to keep her head warm and zip up the jacket nice and snug so the chill doesn’t sneak in. And if her fingers need some cozying, put them in the sweet zippered hand pockets.